Raaga.com: Ghost of Salman Khan’s bodyguard continues to hound! Petition to probe his mysterious death!! Ghost of Salman Khan’s bodyguard continues to hound! Petition to probe his mysterious death!! The BAJRANGI BHAIJAAN star Salman Khan has been once again dragged in the infamous 2002 hit and run case after getting some relief last month, when his five years sentence by session court was suspended! 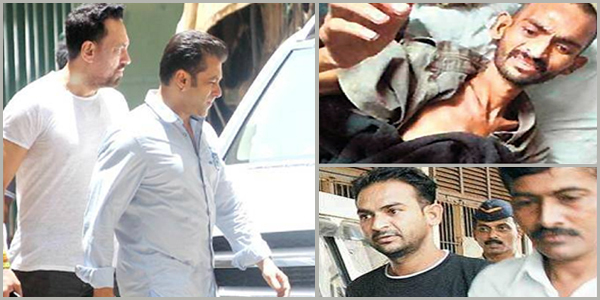 According to recent reports on June 25, a Pune based activist, annoyed at the special treatment meted out to Salmank Khan and granted bail in a hush-hush in the hit and run case, has filed a petition in the Bombay High Court seeking to re-investigate the mysterious death of Salman Khan’s bodyguard Ravindra Patil. It may be noted Salman Khan’s bodyguard Ravindra Patil, was trained as a commando to join the Special Operations Squad and was assigned as Bollywood actor Salman Khan’s bodyguard as part of his primary duty to guard the VIPs. During the unfortunate accident Ravindra Patil was sitting next to Salman Khan and repeatedly warned Salman to stop reckless driving but he ignored and run over his land cruiser on the poor people sleeping on footpath, killing one and injuring others. In fact after the accident it was Ravindra Patil, who called the police and lodged a police complaint against the actor. Hemant Patil, the Pune based activist claims Salman Khan cannot be pardoned in the hit and run case because he had used everything viz. money, power and muscle to pressurize the key eye witness Ravindra Patil to such an extent that he ruined Patil’s life after a loyal Patil declined to bow to Khan’s diktats. “The plea challenging the conviction will come up before the High Court on July 1,” informed lawyer R N Kachave, who will appear on behalf of the petitioner. He added, “When Patil declined to change his statement Salman Khan and his aid made his life hell so much so that he feared to appear in the court. Instead of providing Patil protection, the government and police hounded him and put him behind the bars," the petition alleged. “Aggravated with constant torture by the police on behest of Salman Khan’s associate poor Pati escaped from jail and died under suspicious circumstances," the petitioner further alleged and demanded an inquiry into the death of Patil. It’s true if Patil’s death is probed the truth of Salman Khan’s misdeed will be exposed! But how many more years will it take for the law to bring him to book?? ?